Inspired artistry, our INK+IVY Bas window panel is a modern take on the beauty of mosaic tiles. Etched diamond tiles are featured in gradient hues of grey, combined with the lightweight fabric for a soft and fresh update. Grommet top detail makes it easier to hang, open, and close panels throughout the day. Fits up to 1.25-inch diameter rod. The colors(spice) are true to the picture and the hand feel of the fabric is luxurious. The fabric is casual and airy and is best where privacy is not an issue. I would recommend. 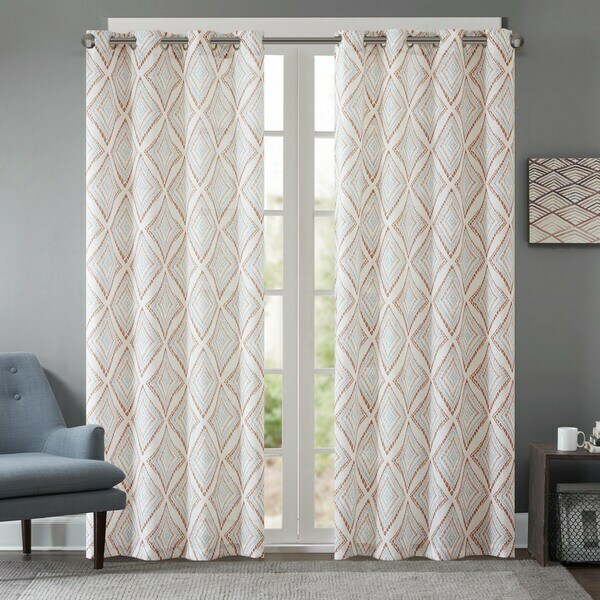 Bought these curtains for my living room and dining room in hopes of letting a little more light into our home. They are a beautiful color (true to the picture) and look fabulous. They draw your eye without being too overbearing in the room! The only downfall is the material is a bit thin so it is a bit see through. Overall very happy with this purchase! These curtains are perfect if you don’t need a blackout lining. The design is similar to a pattern I found in a high end design shop which was five times more expensive. I’m super happy with this purchase! Soft and elegant - great accent for room. Color different than picture. Returned them. Design would match room and other furnishing. Price is also reasonable.